Back-to-back deck techs!? You betcha! I’ve been putting some more thinking into what Iconic Masters means for Magic, and how Wizards of the Coast could have approached it. I think there could be some pretty important reprints in that set that will help Eldrazi Tron the most, and I want to talk with you about them! Eldrazi Tron is the newest flavor of Eldrazi decks that revolve around the bulky beaters printed in Oath of the Gatewatch. It’s a flexible deck that avoids most of the pitfalls of a traditional Tron deck, and has access to more explosive starts than Bant Eldrazi. Eldrazi Tron fuses those two decks, playing to their respective strengths without really adopting their weaknesses. Note: This decklist was slightly modified, as the sideboard only included 2 Chalice of the Void and 13 cards. I assume there was a mistake during decklist translation and it should be 4 Chalice of the Void. Who Is Eldrazi Tron for? Eldrazi Tron best suits players who don’t mind getting their hands dirty with some brutally efficient creatures at the cost of giving up colored spells. It interacts better when it’s the aggressor, which it can do by just playing big threats and not actually having to disrupt opponents much. It’s easy to pick up and play for beginners, but also produces some tough lines that reward more experienced players. I’d say it’s one of few decks with both a high skill floor and skill ceiling. In other words you don’t need tons of experience to pilot it competently, but there are still plenty of edges to be gained as you learn the deck better. This deck is very similar to Bant Eldrazi, so it’s hard not to compare the two. Due to its access to colored mana, Bant Eldrazi gives you more card selection (Ancient Stirrings) and more sideboard options (Rest in Peace, Stony Silence, Engineered Explosives, etc.). The downside is that the colored mana often reduces your starting life total to 17 or 15 due to fetches, shocks, and pain lands. Losing life proves especially problematic against aggressive decks like Burn and Affinity. On the other hand, Bant Eldrazi also has Eldrazi Displacer and Drowner of Hope, each of which can dominate creature matchups single-handedly. Eldrazi Tron is slightly less expensive to build. It doesn’t need as many Cavern of Souls, and the other lands are also generally much cheaper. In terms of strategy, Eldrazi Tron is less sensitive to the land destruction cards used to disrupt Bant Eldrazi and regular Tron decks. Since all of its lands make colorless mana, it doesn’t really care about getting hit by the now-ubiquitous Ghost Quarter. I don’t expect Eldrazi decks in general to get a lot of love in the near future. We got four whole sets of them in a row in Standard, and I think that players are pretty sick of them, so they may be retired for a while. It’s possible we get an Eldrazi Commander deck, since it’s a pretty well-supported tribe, but any new cards there won’t be Modern-legal. The most impactful improvements I can foresee in the future are to the colorless hate cards. Right now, Eldrazi Tron leans heavily on Chalice of the Void to interact meaningfully with creature-light, spell-heavy decks. I don’t see a future where we necessary get a card that is better than Chalice at that job, but maybe we’ll get cards that interact with the graveyard better, or Wizards will decide to slap Thorn of Amethyst‘s ability onto an artifact creature. Thorn is already played in the similarly-built Eldrazi decks in Legacy, which need extra interaction for noncreature spells. Looking over lists, it appears Eldrazi Tron is in a feeling-out phase at the moment. While it’s not hard to identify the cards that form the true core, numbers sometimes vary between lists. In addition, certain core cards, while always appearing the 75, are alternately relegated to the sideboard. I can’t think of another deck for which so many players have come to the conclusion that a card is necessary, but are in disagreement about where to put it. That being said, I think the core of non-land cards is definitely Matter Reshaper, Thought-Knot Seer, Reality Smasher, Walking Ballista, Endbringer, Karn Liberated, All Is Dust, Expedition Map, Mind Stone, and Chalice of the Void. Chalice is the oddest card, because there is often disagreement about where it should end up. In any case, it is extremely important to the deck. The lands in this deck also form an important part of the core. I would not play the deck without Wastes, Eldrazi Temple, Cavern of Souls, Urza’s Mine, Urza’s Power Plant, or Urza’s Tower. Wastes stops you from randomly getting hosed by Ghost Quarters and Blood Moons (remember, you need colorless sources to cast your creatures!). The first order of business should be getting the creatures from Oath of the Gatewatch squared away. They are insanely cheap for what are basically Legacy and Modern staples. About $50 is all it will set you back for Thought-Knot Seer, Reality Smasher, Matter Reshaper, and Endbringer. Just do yourself the favor and grab ’em now, because they’re really not going to get much cheaper. While it is true that they rotate out of Standard this fall, they basically see no play in competitive Standard decks—their price tag is held up almost entirely by demand from Modern and Legacy players. After these cards, it’s a little harder to decide which purchases to make. I’d recommend getting Expedition Map and Mind Stone, as their price is also influenced by Commander players. If there’s anything I’ve learned about the financial dynamics of Commander cards, it’s that you often don’t know they’re going to spike until it’s too late to do anything. Next, you should bite the bullet and buy the cards that were recently reprinted in Modern Masters 2017. Cavern of Souls and Basilisk Collar are the highlights here. While I think it’s pretty unlikely that we get an Eldrazi Commander deck, I wouldn’t fault you for waiting on All Is Dust and Eldrazi Temple next. Those two cards are most likely to be inclusions in that style of deck, which would lead to a significant price decrease, like the Merfolk cards I talked about last week. That being said, I think an Eldrazi Commander this soon is unlikely, since we already have five to choose from. What’s left? The cards I think might be part of Iconic Masters. It’s really hard to put a finger on what is “iconic” in Wizards of the Coast’s eyes, but I think there is an argument to be made for a few cards in particular. Is Urza’s Tower an iconic land? I think so. Why does it matter? Well, the Tron lands themselves are not particularly expensive. You can find all 12 for around $15 if you buy the cheapest ones. Things get interesting when we look at people’s preferred Tron lands, which are sometimes quite expensive. Your options for black-bordered Tron lands are foreign black-bordered 9th Edition (Russian), Antiquities (~$8-10), or Foil 8th or 9th Edition (~$40 if you can find them). If the Tron lands are reprinted in Iconic Masters, the market would be flooded with these desirable cards, alleviating some of the foil price if that’s your thing. Along a similar vein, I think that you are good to wait on Karn Liberated and Chalice of the Void to see if they’re included in Iconic Masters, because you don’t really have much to lose. If they don’t get reprinted, they might be up a few bucks per copy. If they do get reprinted, you might end up spending half as much on them. The card I want to wait the longest for is Walking Ballista. It’s a cornerstone of so many Standard decks that you can really save yourself a lot of money if you wait for it to fall out of favor. That might not be for a year and a half until it rotates, but it certainly won’t get terribly more expensive in the meantime. Hey, maybe you don’t care if you have to use Chronicles or 5th Edition Tron lands. If it’s fine with you, it’s fine with the DCI. You can always upgrade to some less grotesque-looking lands later. Jokes aside, I would spend most of my money buying into sideboard options so I can customize my deck and adapt to shifting metagame. If you see a lot of Storm or Dredge, then maybe you want some Surgical Extractions in your sideboard. If you have a lot of Jund players in your area, maybe you’d rather play more Hangarback Walkers and Ulamog, the Ceaseless Hunger. 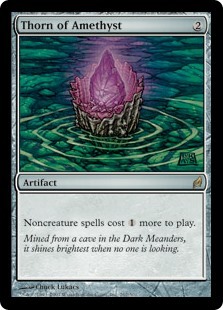 While it isn’t an upgrade per se, I would probably invest in a playset of Endless One and Eldrazi Mimic. They were once an important part of the deck, and I can see some scenarios where you’re going to wish you had bought them for about $1 each (which you can do now) instead of having to spend $4-5 on them should they break out in a weekend. Eldrazi Tron is likely here to stay and will be a powerful deck for the future. It’s relatively inexpensive to build, and with a few more reprint opportunities in the wings, you might find yourself spending a lot less for a new Modern deck than you originally anticipated. I love these articles dude. Pin pointing priorities in purchasing order and when or when not to buy them and the reasons why. I’m content with burn and living end I will probably never buy into eldrazi but you captured my attention enough that i read the whole article lol. good job.